I really can’t summarize the book without giving away what’s happened in the previous works of the series, but let’s just say that it’s more of the same. Stuff is bad, it’s getting worse, and everyone is too focused on their own concerns to see the bigger picture. In Storm of Swords, Jaime Lannister is given a POV and quickly earns his way into my good graces. Martin has done an amazing job at creating convincingly grey characters, and allowing for multiple interpretations of the same events. By giving the reader insight into Jaime’s motivations, Martin shows us a man who wishes to honour his vows, and who was willing to break them and sacrifice his reputation to protect the innocent. Tyrion Lannister is still one of my favourite characters, and we see quite a bit of his development in this book, but there’s something that’s been bothering me. From the start, he is played as “the clever one.” Jaime is a great fighter, Cersei is beautiful, and Tyrion is clever. Yet from the start, he’s never struck me as especially smart. He’s borderline witty, although he seems to simply subscribe to the buckshot school of wit (make as many japes as possible and hope that some of them land). And, quite frankly, his mocking jokes are frequently ill-timed and just get him into trouble. I’ve read a couple reviews mentioning Sansa Stark and how weak and annoying she is. She’s no Arya, certainly, but is she really so weak? Arya and Brienne of Tarth are both aberrations in Westeros, and not really an option for females. Sansa is the more realistic of the three. She is a woman and she is acting within the female sphere to survive. Far from being some passive little china doll, I found her to have incredible strength and an active agent in her own right whenever she sees the opportunity. Consider, for example, how she uses Ser Dontos Hollard to escape King’s Landing, or how she tries to escape Joffrey by marrying Willas Tyrell. She’s afraid, to be sure, but so is Arya. The difference is that Arya survives by using her sword while Sansa survives by using her courtesies. Personally, I admire Sansa’s strength, all the more because she carves out her survival in the “woman’s domain” (historically speaking) rather than pushing herself into the “man’s sphere” as Arya does. One final note, I am “reading” this via audio book (because it’s a hands-free way to stave off boredom while nursing) and it needs to be said that Roy Dotrice is amazing. He makes the characters come to life by giving each a different voice. It was hard for me at first because it shaped my perception of the characters – something that I like the written medium without – but it’s grown on me. And Dotrice’s range is truly impressive. 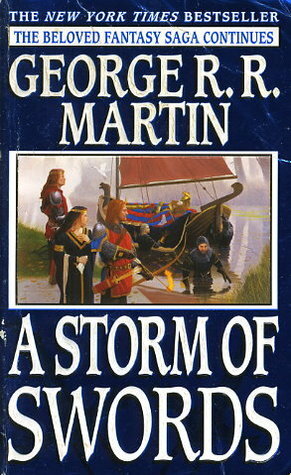 Sign into Goodreads to see if any of your friends have read A Storm of Swords.